Mia’s sparkling personality lights up any social gathering. I usually don’t think about it until after I’ve posted. lol I just try to post a comment to get the discussion started. What could be worse then the guy dying, but still not so bad that they all survive? So my bet’s are on good. Hmm, good point. Maybe Mia has way more control over the ring than she thinks she does. 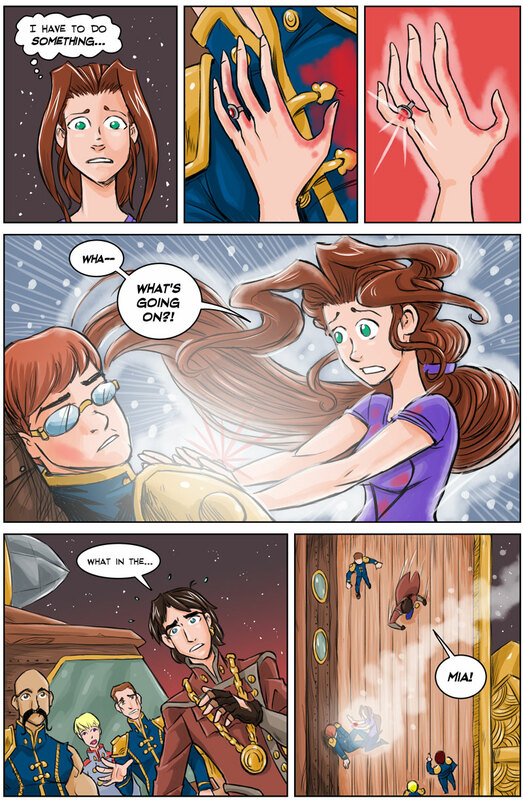 Can I just say that I love the hair on the fourth panel? Is there a tip jar somewhere around here? Because so many people have been asking us lately, we’ve added a tip jar at the bottom right-hand side of the page. The thought is definitely appreciated! Magical Girl Mia transformation time! The real question is, is this just the rings doing or is the ring enabling the untrained ability Mia inherited? Laser shots and healing too? Is there anything this ring can’t do? How ’bout taking Mia home? That seems like a problem. Is he afraid she will botch it? Or does he think she wants to take him away? The white smoke is remotely similar to her teleports. Does he think she will remove the hole by blasting a bigger one? Not purposely, of course. Are there dangerous costs of the spell he doesn’t want Mia to pay for, like taking a wound instead of healing it? Does he want to help? Is he just curious? Or maybe even envious? …and after writing this, I realize there are still about 70 pages archive left until I’m up to date and I just have to click “next” to find out… duh.